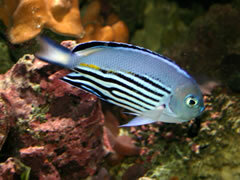 An active swimmer the beautifully patterned male Genicanthus watanabei settles well into most aquaria and is considered by some authors to be one of the most hardy of all angelfish. The Watanabei or black-edged angelfish belongs to the genus Genicanthus, the so-called swallowtail angelfish. Swallowtails are distinct from most other angelfish genera in that they have distinct male and female colour morphs so even though the species is the same you can keep two sometimes markedly different-looking individuals in the same aquarium. The origins of the slightly unusual but catchy common name centre on a quite ordinary Japanese surname shared by many excellent zoologists both past and present. The subject of Top Marques this issue was named by two Japanese researchers in honour of one of the most eminent Japanese ichthyologists of the last two centuries. The Genus Genicanthus is a group of angelfish that feed primarily upon zooplankton although they will scour rockwork in aquaria for tasty morsels. This means that unlike other angelfish that remain close to the substrate the swallowtails can be more obvious and “showy” in an aquarium situation. They are active swimmers and should be given adequate room particularly if a pair or more is to be kept. This busy lifestyle means that the watanabei requires regular feeding in order for them to keep in good health. Specimens will accept most frozen, flaked and pellet diets readily and will also benefit from the regular addition of dried algae which they will tear from a lettuce clip with relish. The female watanabei angelfish lacks any yellow patches or black horizontal stripes on the body. She is also slightly smaller than the male. As with all angelfish species in which the sexual relationships have been studied swallowtail angels are protogynous hermaphrodites. This means that individuals start life as females becoming males later on in life if the opportunity presents itself. This can mean that specimens originally purchased as females have the potential to turn into the males. The good news is that this can double their value and given the rarity of male individuals within the hobby offers the prospect of subsequently pairing up the male with more readily available female. Care should be taken if active zooplankton feeders are already present in the aquarium before you decide to introduce any swallowtail angelfish as the watanabei can resent the presence of what they might perceive as natural competition for their major food-source. Other than these there are no real fish compatibility issues for this species other those that can be tackled with a little common sense. Watanabei angelfish are not commonly encountered in the aquarium hobby in the U.K. and demand for them is lower than might be expected for such stunning fish. They are reef compatible in most cases (every fish species will have its rogue individuals) showing little if any interest in sessile invertebrates and usually settle well into their aquarium existence. We suspect that the popularity of this species might increase if more specimens become available and they are presented in a way that does them justice. A female specimen located in a standard retail selling aquarium lit by standard white fluorescent lamps is unlikely to inspire many aquarists particularly with such a relatively high price tag. However, if you come across this species in an aquarium lit by metal halides then the exquisite pale blue colouration makes your heart melt and fills you with the desire to take the individual home with you whatever the cost! In their natural reef environment of the Western Central Pacific including the southern Japanese Islands and the Great Barrier Reef watanabei angels are found in pairs or in harems of up to five individuals. This means that males are even rarer within the marine hobby than females but does offer some nice possibilities of housing more than two individuals together in the same aquarium. The aquarium specimens depicted here were originally introduced as a pair. Some time later a second female was added. The original female showed a little resentment to the new fish for a matter of minutes and now the three individuals coexist happily. It should be noted that it is not necessary to keep this species in pair or multiples as individuals will thrive on their own. However, given the colour and pattern difference between males and females it is nice where space and finances allow to keep a true pair. When first introduced to their new aquarium Watanabei angelfish can appear quite shy at first and will often take refuge in the rockwork. This is usually only a temporary situation and their pelagic instincts will come to the fore and they will be almost permanently on show after this time. In their wild state they are found in depths over 20 metres and so the brightly lit aquarium may appear slightly alien to them at first. This is never usually a long-term problem and they adapt readily to strongly lit aquaria. The cost of Watanabei angelfish will vary according to their source. Specimens imported directly through, for example, the Philippines may cost significantly less than those obtained from a marine wholesaler but they come with the inherent risks associated with direct importation. Females being smaller and therefore taking up less space in a box are significantly less expensive than males; the latter being less commonly encountered for the reasons cited above and therefore command a higher price. However, specimens imported through Hawaii are packaged extremely well and the fact that the wellbeing of the fish is prioritised can mean that a moderately sized pair can occupy the bulk of a single box. Freight costs must then be added to a fairly moderate cost price resulting in a very substantial retail price. There may also be a premium for true pairs levied by the vendor despite the fact that males and females seem to be quite easy to unite in the same aquarium even if obtained from different sources. Thus a female Watanabei angelfish might cost anywhere in the region of £50-£100 and a male £120 +. A true pair is rarely encountered but will set you back anything from £200-£300 and possible more. We think that most aquarists would be hard pressed to disagree that this species is worth it!